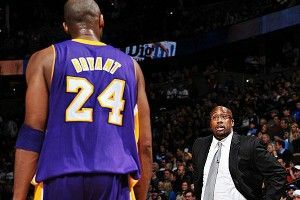 Before he became the Lakers’ coach, Mike Brown worked under Gregg Popovich with the San Antonio Spurs. During his first season in Los Angeles, Brown hasn’t used many sets that came from the Spurs — until last night, that is. Tied 93-all against the New Orleans Hornets with 2.1 seconds left, everyone expected Kobe Bryant to get the ball in isolation. You know the drill: He runs to the ball and fires up a tough jumper. But last night, Brown used the threat of Bryant’s standard one-on-one last shot to set up a much easier, wide-open look for Bryant, and the play came almost straight out of the Popovich playbook. The Lakers start with Derek Fisher in the corner, Pau Gasol and Andrew Bynum at the free throw line, and Bryant under the rim. 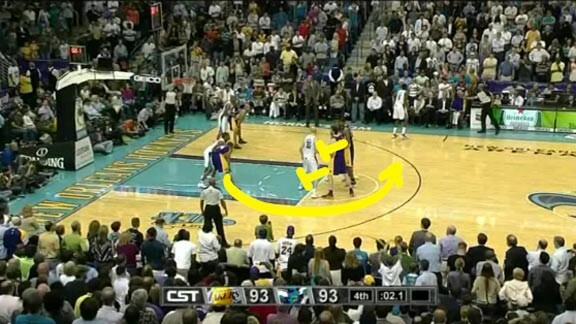 When Metta World Peace inbounds the ball, Bryant curls around two screens set by Bynum and Gasol and heads toward the ball. Gasol slips his screen and runs to the front of the rim. Bynum stays in place at the top of the key as Bryant sprints at the inbounder. At the last second, Bryant turns around and doubles back, using a second screen set by Bynum. When Bryant comes off that screen, World Peace passes the ball to the corner where he knows Bryant will be. Bryant runs underneath the ball, makes the catch, and gets a shot off before the defense can close out. He misses the game-winner (the Lakers won 107-101 in overtime) but this was still a great play. Brown used Kobe running to the ball as a decoy. 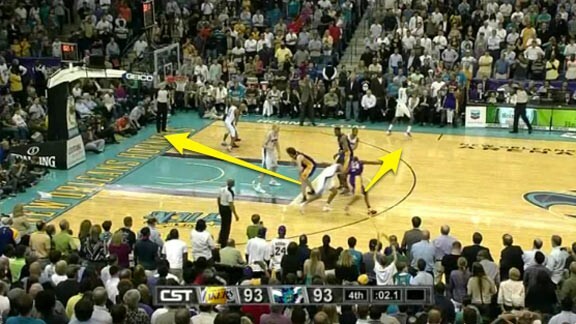 The defense fell for it and shifted to challenge Kobe’s expected isolation jumper. 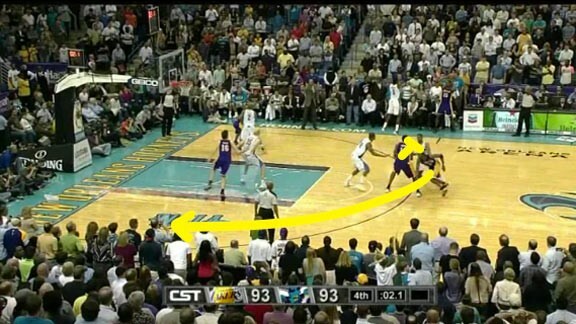 When Bryant doubled back, his defender got stuck on Bynum’s back screen and it led to a great look. Popovich and the Spurs made that “windshield wiper” action famous, and they’ve used it several times over the years to set up open 3-pointers and layups. In the video below, from last season, San Antonio uses the windshield wiper to set up a game-winner for Manu Ginobili. There are some obvious differences between this play and the one the Lakers ran last night, but the similarities between Bryant’s and Ginobili’s cuts are unmistakable. The difference in time — 2.1 seconds for the Lakers and 7.1 for the Spurs — is why Bryant got a screen and Ginobili didn’t. Popovich knew Ginobili had time to make a move after catching the pass, while Brown had to design a catch-and-shoot play for Bryant. To create a little extra space for a quick shot, Brown added the screen from Bynum. Borrowing plays is what good NBA coaches do, and seeing Brown use one of Popovich’s plays should be a welcome sight for Lakers’ fans. When it comes to late game situations, Pop is the best in the business, and if Brown can use some of his old boss’s great sets with a finisher like Bryant on the roster, the Lakers could be very dangerous come playoff time. PUT YOUR HANDS UP, Ohio State!